Hello everyone, and Happy Friday!!! 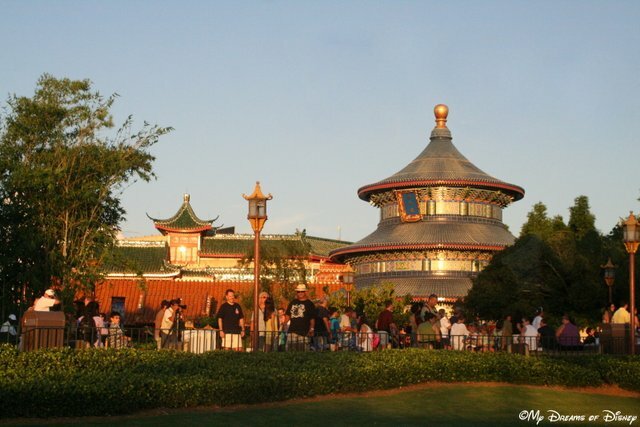 Today is Day 86 in our #DisneyWorldCountdown, and for today, we’re heading over to Epcot’s World Showcase to talk about the 2nd of the CircleVision 360 movies. This one is located in the China Pavilion, and is aptly named Reflections of China. I like Reflections of China because it provides a glimmer of what life in China is like — or, perhaps, was like — in the days of yesteryear, before everything became so politically motivated. However, because China is so restrictive towards Western culture, the film is dated, and feels like it could benefit from an update to the movie. However, that doesn’t seem very likely in today’s day and age. So, instead, we are stuck with what we’ve got, but despite that, I truly do enjoy taking a look at Reflections of China. I think that, for me, it’s the ability to immerse myself in the culture of a country and learn more about it that makes the World Showcase such a great place to visit. Where else can you travel and visit 11 countries all in one day, eat local food, speak with people native to that country, and pickup on the cultures of that country? Have you ever seen Reflections of China? If so, what did you think of it? Or, if you haven’t, why not? Please let me know in the comments, and thanks for stopping by today! If you haven’t seen Reflections of China, do yourself a favor and see it once — you might find that it was more enjoyable than you thought it would be!